Delivery will normally be no more than 5 working days from receipt of order and payment. Most orders however are sent out the same day if the order is received up to our 2pm cut-off time, stock depending. Orders received after this time will be handled the day after. 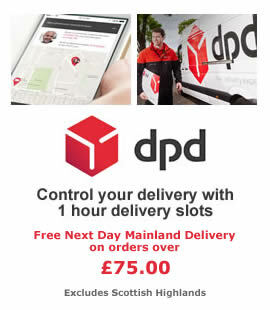 All orders are delivered by either our chosen courier partner, DPD, royal mail or by our own drivers if the delivery is local. All courier deliveries must be signed for. If your goods are being delivered by courier, an e-mail or text message will be sent to you the day before and on the morning of delivery providing you with an hour time slot for your delivery. If this is not suitable you can re-arrange the delivery date by following the links on the email or text message. Unfortunately the time of delivery cannot be changed, only the day. Postage charges are for standard First Class mail, and not guaranteed. Delivery is stated at 2-3 days. All orders over £75 inc VAT destined for the UK Mainland are carriage paid. Certain other areas in the UK carry a premium carriage charge i.e Scottish Highlands and Isles, Northern Ireland, and Isle of Man. If in doubt please e-mail us for a delivery quote. International deliveries can be arranged upon request. Please email us a list of your requirements and we will provide you with a written quotation including carriage costs. All orders must be carefully inspected upon delivery for signs of breakage or damage that may have happened in transit or the manufacturing process. All such problems must be reported in writing within 3 working days. Claims outside this time may be refused as we cannot claim against the courier or manufacturer. Further information on our courier service can be found here Deliveries. As per the Consumer Contracts (shopping online) Regulations 2004, 4LED offer all their customers a cooling off period. Unlike other online stores though, instead of the statutory 14 working days, we offer a full 30 days on all returns. If you wish to return goods to us during this time or for any other reason, please ring us on 020 8326 0148 or contact us by email sales@4led.co.uk. Please note all goods need to be unused and in perfect condition, unless reason for return is to replace a faulty item. All products listed on 4LED come with a warranty. These warranties range from 1 to 10 years, warranty periods are shown on each product. In the first instance, please contact us via telephone or email to discuss the fault. Please note we will always endeavour to replace faulty components and not complete fittings where applicable. Should a fault occur within your warranty period please call the sales team and they will issue returns authorisation which will be required to return any goods. Please do not send goods back without authorisation as it could result in the problem not being resolved. Upon return, the goods will be inspected and tested and either the complete unit replaced or the faulty/damaged component. Please read the returns section above for more information on returning goods to us. CED LTD (the owners of 4LED) make no representation that information in this website is correct. While we endeavour to make sure that all information, descriptions, dimensions and stock availability is accurate and up to date, mistakes do happen whether it be a typographic or a mistake in the information supplied to us via our manufacturers. CED LTD's directors, employees, contractors or it's subsidaries will not be held accountable for any damages including loss of profits or earnings arising from any such inaccuracies.